Nephrite jade and gold, fashioned, pierced, carved and polished using abrasives and abrasive-charged tools. 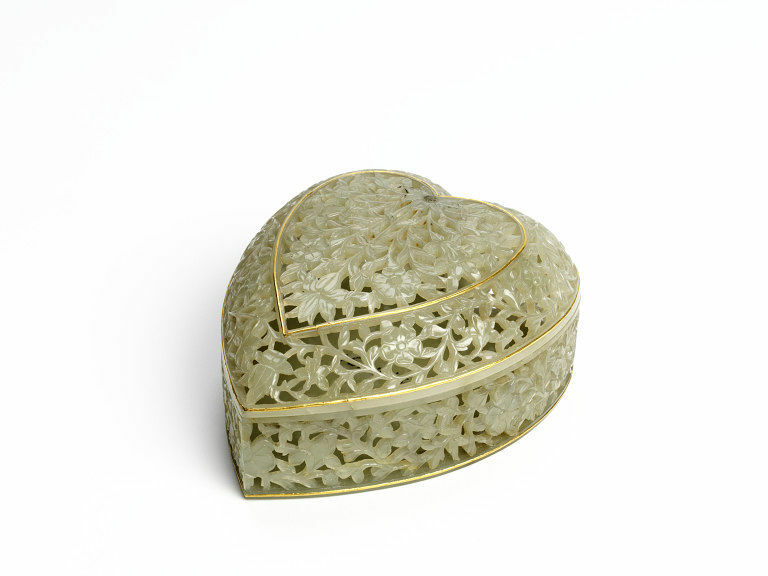 This perforated jade covered box was sent to the Great Exhibition of 1851 at London's Crystal Palace where it was described as being of 'modern' manufacture, and from Lahore. The technical skills needed to create it were the same as those used during the 17th and 18th centuries in the Mughal empire of which Lahore was the northern capital. The two parts have each been expertly fashioned from a single piece of nephrite jade, which is a hard and durable material that requires patience and skill to work and then they have been inlaid with gold. Although it is a hard material, when it has been worked to give fine edges or thicknesses, it can be prone to damage by sharp impacts or significant and rapid changes in temperature. Although this was made for the exhibition, similar objects would have been destined only for wealthy or powerful people. 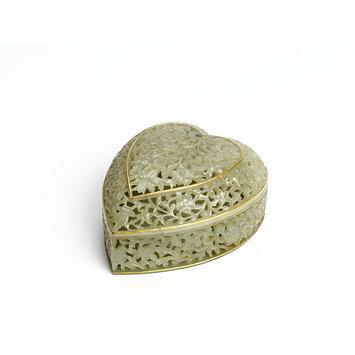 A heart-shaped box and cover, with pierced openwork all over the cover and the sides of the box, with a floral design that has detail carved in low relief, the decoration being in Mughal revivalist style. There is a fine inlaid gold band on the top of the cover and another just above the lower rim. There is a third band on the box, just above the solid base. Fashioned in pale greyish green nephrite jade that has some greyish mottling and brownish-green patches. There are a few cracks present to both parts. Bought from the Great Exhibition of 1851 as being of recent manufacture and from Lahore, for the sum of £20-0-0.